This Metal Book Marker Is Shaped Into A Treble Clef Design At The Top. A Practical And Decorative Gi.. 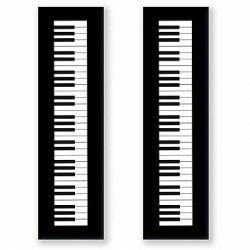 KEYBOARD - 2 Bookmarks signature 20 x 5,6 cm Vienna WorldΔύο σε&..